This is my first post from Botswana, Africa, where I am introducing Nonviolent Communication (NVC) to many sectors of the population. On Saturday, a group of about twenty parents assembled here in Careena Centre for Health, in the heart of the capital city, Gaborone, for a class in Parenting with NVC. Three teenagers joined their parents in the workshop. Fourteen younger children joined medical doctor and dance therapist Ava Avalos in the separate children’s program. The event was sponsored by Mandy’s Nannies, brainchild of Amanda Chukura , an organization dedicated to supporting parents and childcare workers in Botswana. Needs are the very energies of life, in the form of Aliveness moving in and through us. Fundamentally, Needs are the resources life needs to sustain itself. 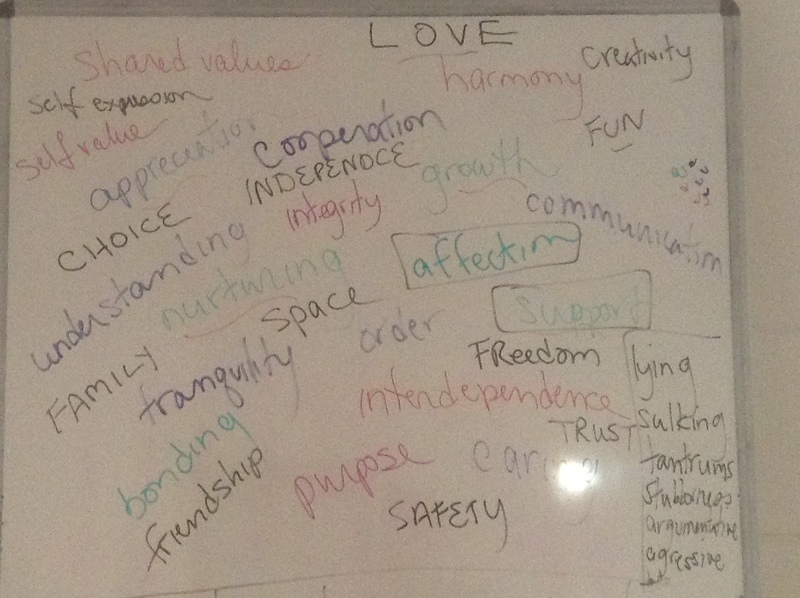 We began with an exercise to identify the Needs that, as parents, we are yearning to meet. I asked the participants to sit together in pairs and look at the CNVC Needs Inventory list , and to pick two Needs that are core to their parenting, and then to share about those Needs with their partners. We then filled the board with those Needs, by writing down what the participants told us about the Needs they had heard their listening partners share. As we filled the board with the parents’ Needs , we explored some key NVC concepts, such as the difference between Needs and the strategies we employ to meet Needs. As parents, there are multiple Needs we want to meet in our parenting, such as connection to our children, peace and harmony in the family, and supporting children’s well-being, safety and health. We looked at the Needs behind a parent’s strategy of ” forcing” a child to brush her teeth right after she eats—this may support the Need for dental health, and for the parent’s self-acceptance, but it is at the expense of Needs for harmony, peace and a satisfying connection with the child. We looked at how the different sets of Needs weren’t in conflict— it was the strategy of wanting this particular child to brush at a specific time that was creating the conflict. This strategy was not considering what the child’s Needs were at that time, perhaps for choice and autonomy, or play, or connecting with the parent. We explored the power of curiosity— instead of getting angry at the child when she isn’t doing what we want her to do, can we get curious about, and hold with care, what is important to her in that moment? Can we get curious about ourselves— to understand, and hold with care, what is so important to us about this happening in this specific way at this specific time? We discussed how conflict occurs when we believe there is only one strategy to meet our Need. ( one action, at one time and place.) The good news is that there are many strategies to meet every Need. When we are stuck on one strategy, it’s a crisis of imagination, a world of scarcity. By understanding, from our own experiences, that conflict exists only at the level of the strategies we employ to meet our Needs— not at the level of Needs— we feel more confident about being creative and flexible with our strategies; we see the possibility of discovering new strategies that meet our Needs without trampling on others’ Needs. We move from an adversarial model to a partnership model— from the scarcity mindset of “either my needs or your needs,” to a shared inquiry into finding strategies that will meet everyone’s Needs and also contribute to a relationship of trust and mutuality. By understanding that all of our choices as humans— words, actions, feelings, and thoughts— are attempts to meet our basic universal human Needs, we can stop judging others when they engage in behavior that we don’t like, and shift to a quality of curiosity: “What is it that is so compelling or important or juicy to them, that they are engaging in the behavior?” This change in our thinking allows us to shift from conflict with others over strategies to shared partnership in finding the important Needs that both parents and children want to meet, and to finding new strategies that will meet everyone’s Needs. This is a nonviolent model of addressing the dilemma of conflicting strategies. Many parents in the room expressed a yearning to have the quality of connection with their children (and others) that comes out of valuing everyone’s Needs. There was collective grieving and frustration about the rapidly changing society, where kids are more separate and in their own world than before. We started to get more and more curious about what’s going on with the younger generations. We looked at situations where there was conflict between parents and their children, and I wrote on the board the Needs the parents identified that children have in their relationship with parents. We imagined the Needs of the children in our lives, and we thought about the Needs we had when we were children. I wrote the parents’ Needs in multi-colors on the board and the children’s Needs in black. The parents began calling out many Needs that children want to meet (see them in black marker in the photo above). Several parents commented on how they had never considered that their children had Needs they wanted to meet in the parent-child relationship. Others shared how surprised, moved and thoughtful they felt seeing that children and parents share many of the same Needs. Still others shared how just looking at the Needs that may underlay their children’s actions—even ones that regularly bothered them— changed how they felt about the behaviors . We then explored through role-playing what it would be like to address real-life situations through the lens of the parent’s and the child’s Needs. One father wanted to know how to deal nonviolently with a three-year- old who hits his father when his father says “no” to him. We asked the teenage boy in the workshop if he would be willing to role-play the three-year-old. We watched the three-year-old approach the father’s keys with curiosity, and the father first said no. We then asked the father what needs he thought the three-year-old might be needing and wanting to play with the keys. The father guesed fun and play. Other people guessed that he was curious about what the father was always holding in his hands. Hearing all this, when we redid the situation, instead of saying no, the father asked the little boy if he wanted to play together with him. Let’s see what happens if the two of you redo this same scenario, except this time, instead of the conversation being between the mother and her daughter, it will be between the mother, who is a doctor, and a doctor colleague of hers whose office is right next to hers. We stopped the role-play there to discuss the difference between the mother – daughter conversation and the colleague – colleague conversation. People commented on the differences in the mother’s body language and facial expression. With her colleague, she was smiling and spoke more softly and slowly, visibly controlling her discomfort with the housekeeping conditions. And, very notably, she quickly found another strategy that would meet her need for order and also her colleague’s need for respect and autonomy. This was the strategy of meeting in her office. Then we asked the teenaged woman who was playing both roles what was the difference for her? She said that, as the daughter, she had no willingness to engage with the mother. As the colleague, she didn’t feel defensive and it was easy for her to say, without the pain of judgment, that, yes, her office could use some tidying. We tracked back to the Needs parents want to meet in their relationships with children, important Needs, for their children’s well-being and growth – the fears of parents , the self-acceptance parents often need in trying to meet their children’s Needs. And now we see the harm that can be done when we forget the children’s Needs- harm to the children as well as to other needs of the parent—for love, connection and trust between parent and child. After the role-plays, parents poured out their hearts about their fears about the growing alienation between parents and teenagers in Botswana society. Several spoke about how their children are truly living in a world vastly different from their parents’ childhood, where parents and teachers routinely hit children, and demanded and received obedience. Today, teens take their dinners into their rooms to be with their friends on social media instead of joining the family at the dinner table. After school, teens go into their rooms and don’t want to engage with the family. We asked one of the teens in the workshop to help us understand what Needs he was meeting by going into his room after school, and declining to talk to his parents. He took a few moments to look over the Needs inventory list. The room quieted as we took in the awareness and passion of this young man to bring self care and Self -value into his life. I asked the parents if it affected them, if their own energy and strategies were affected, when they heard this expression of the needs the teens wanted to meet when they did what they did. There were many nods of assent and exclamations of intentions and insights from parents – an eagerness to bring the consciousness of Needs into their parenting. And they spoke and connected around the beauty of each others’ Needs and encountered each other in a way that had never before happened. Such clarity of intentions and the engagement around NVC that I receive from this carefully crafted piece. Thanks for the work Roberta, and for sharing. Joe, more coming and so sorry to miss you in South Africa. Roberta, how moving it is to hear the cross cultural needs of children, teens and parents! I feel more connected to families in Botswana hearing about your workshop.